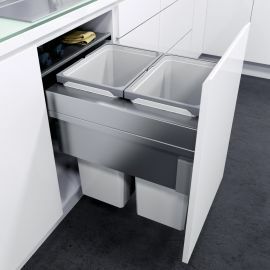 This sleek and stylish VS Envi Space Pro 3 compartment in-cupboard recycler from Vauth-Sagel is for use in kitchen cabinets with pull-out doors 500mm wide and provides 46 litres of waste and recycling space. 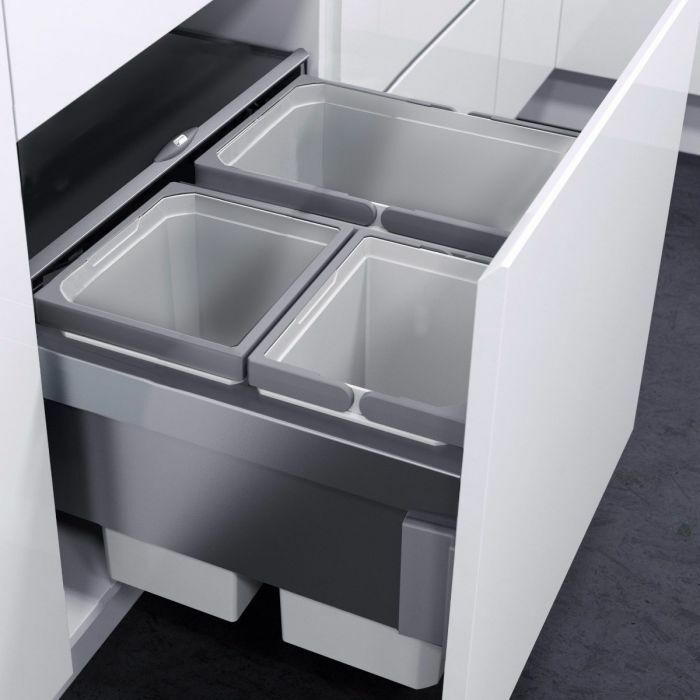 The three inner buckets, 1 x 21 Litres and 2 x 12.5 Litres inner buckets sit on Vauth-Sagel's own design of 'easy-fit' soft close runners for effortless and quiet closing. 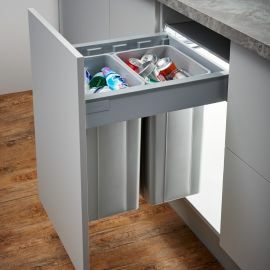 This pull-out bin unit comes with everything you need to turn your cabinet into a hidden recycling bin. 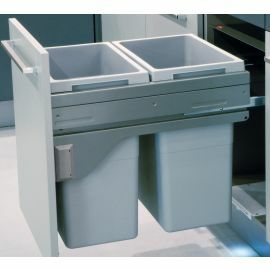 With a minimum installation height of 470mm this bin can be installed in either a cabinet with a full-length cupboard door or one sitting below a drawer. The fully extendable runners make taking out the inner buckets for cleaning and emptying an easy task. The strong steel lid can slide in and out when the cupboard door is open, providing a useful shelf. Vauth-Sagel's quality of design and production is excellent: they make fittings and parts for SieMatic, Lamborghini and Audi and now apply their expertise to In-cupboard bins! See the fitting video above. Fits cabinets with an external width of 500mm; Internal width 462-468mm (with side panels 16-19mm thick). To see our range of products for cabinets with 500mm Pull-out Doors click here. LINERS: Our Simplehuman J Liners (CW0259) are a great fit for the 21L bucket of this product and fit tightly under the handles. If you wish you can easily add these to your order once the bin is in your basket. Silver Epoxy-coated Steel frame, runners and lid: durable, long lasting, hygienic and easy to clean. Inner buckets in silver grey plastic.